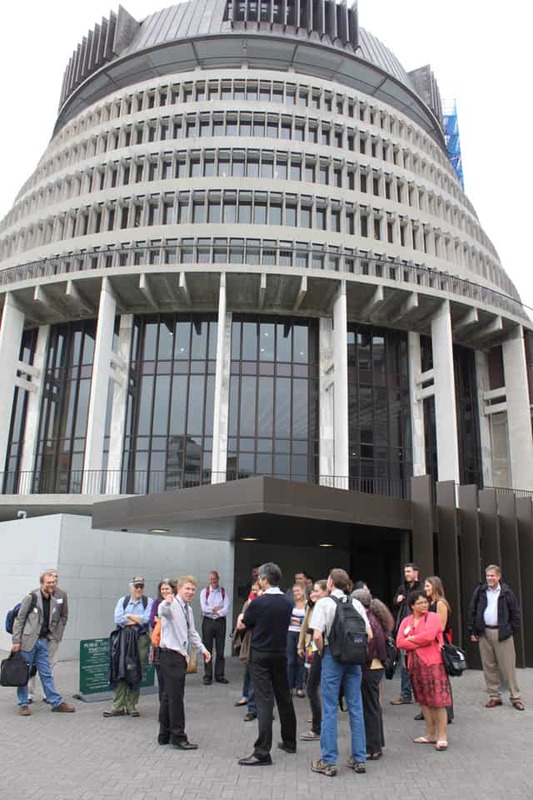 Fulbright New Zealand welcomed 22 American exchange participants to New Zealand last week with an intensive week-long orientation programme designed to outline unique attributes of New Zealand which will inform their study, research and teaching at assorted universities and government agencies over the next three to twelve months. The incoming grantees were welcomed with a pōwhiri and noho marae (overnight stay) at Waiwhetū Marae in Lower Hutt. They visited Ōtari-Wilton’s Bush and Parliament, and through a series of lectures and seminars were introduced to New Zealand, Māori and Pacific history, culture and language, as well as New Zealand’s rich natural history and unique flora and fauna. 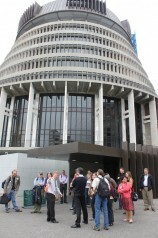 A number of Fulbright and associated exchange programme alumni were among the orientation programme’s speakers – historian Jock Phillips from Te Ara: The Encyclopedia of New Zealand gave a snapshot of New Zealand culture, Victoria University of Wellington lecturer Nigel Roberts gave an introduction to New Zealand politics, and Labour Party MP Shane Jones reflected on life in parliament. Other local alumni home-hosted grantees for the final night of their stay in Wellington. This year’s ten Fulbright US Graduate Students, six Fulbright US Senior Scholars and six Ian Axford Fellows in Public Policy will study and research topics as diverse as conservation genetics, dairy industry development, the geology of Canterbury’s recently-discovered Greendale Fault, special needs education, marine ecotourism, social housing and security cooperation. Wells Weymouth, a Fulbright US Graduate Student and Second Lieutenant in the United States Army from Gainesville, Florida, arrived in advance of his compatriots in order to visit Antarctica over summer, where he conducted research on the impact of melatonin supplements on the circadian rhythms of workers at Scott Base. 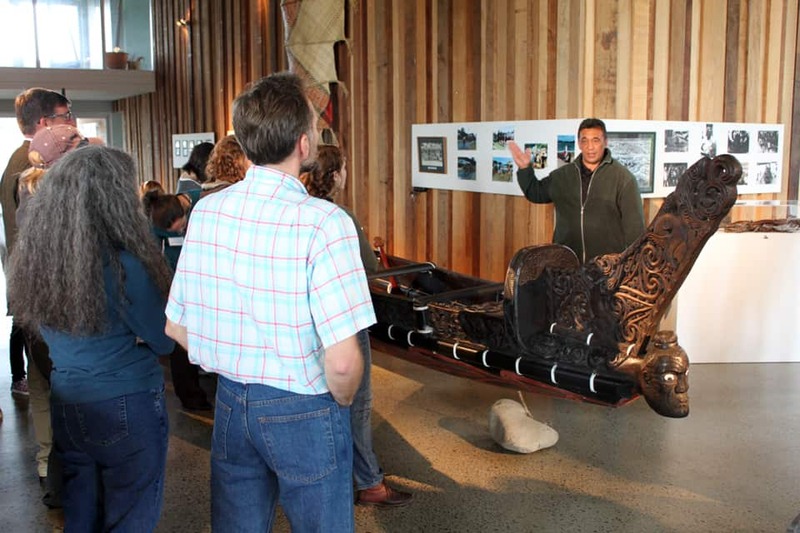 Professor Thomas Wartenberg, a Fulbright US Senior Scholar from Mount Holyoke College in South Hadley, Massachusetts, will work with Island Bay School in Wellington to implement the award-winning Teaching Children Philosophy programme he has developed in American elementary schools, while teaching a course on pop culture philosophy at Victoria University of Wellington. Details of these and other 2012 Fulbright and Axford Fellowship grantees and their exchange projects are below. Laura Bergner from McLean, Virginia will complete a Master of Science degree, specialising in conservation genetics of reintroduced populations of threatened birds, at the University of Otago. Megan Couture from South Hadley, Massachusetts will complete a Master of Urban Planning degree, specialising in sustainable urban design in New Zealand, at the University of Auckland. Nadine Dodge from Salem, Massachusetts will complete a Master of Development Studies degree, specialising in dairy industry development in New Zealand and the US, at Victoria University of Wellington. Jessica Hinojosa from Dallas, Texas will complete a Master of Science degree, specialising in paleoclimatological analysis of the Roaring Forties winds, at the University of Otago. Kate MacDuffie from Philadelphia, Pennsylvania will research whether reward enhances the brain’s ability to imagine future events, at the University of Auckland. Dana Morton from Tracy, California will research patterns of fish recruitment in kelp forests, at Victoria University of Wellington. Katy Orr from Reno, Nevada will research the deposition of polycyclic aromatic hydrocarbons in Arthur’s Pass National Park, at the University of Otago. Peri Sasnett from Kirkland, Washington will complete a Master of Science degree in Geology, specialising in the slip rate and rupture history of the Greendale Fault, at the University of Canterbury. Brinkley Warren from Athens, Georgia will complete a Master of Fine Arts degree, creating an art exhibition of telematic wishing wells for spontaneous intercultural exchange, at Massey University Wellington. Wells Weymouth from Coral Gables, Florida will complete a Postgraduate Certificate in Antarctic Studies, specialising in the impact of melatonin supplements on circadian rhythms of Antarctic workers, at the University of Canterbury. Claudine Bigelow from Brigham Young University will record, perform and teach viola music, at the New Zealand School of Music. Ted Catton from the University of Montana will research and write a comparative history of national park protection in the US and New Zealand, at the University of Canterbury. Susan Faircloth from Pennsylvania State University will research education conditions and outcomes for Mäori children with special needs, at Victoria University of Wellington. Jason Julian from the University of Oklahoma will research how land use change and other landscape characteristics affect optical water quality in New Zealand at NIWA (the National Institute of Water and Atmospheric Research). Tema Milstein from the University of New Mexico will research cultural and communication practices in marine ecotourism, at AUT University. Thomas Wartenberg from Mount Holyoke College will teach a course in the philosophy of popular culture, at Victoria University of Wellington, and will work on introducing a philosophy for children programme at Island Bay School. Craig Lebamoff from the US Department of Homeland Security will research the implications of privacy and sovereignty concerns on NZ-US security cooperation, at the New Zealand Customs Service. Caroline Park from the US National Oceanic and Atmospheric Administration will research US and New Zealand approaches to sustainable fisheries, at the Ministry of Fisheries. Christian Stearns from the US Department of Housing and Urban Development will research the use of a sustainability model to aid in implementing recommendations from the Housing Shareholders Advisory Group’s report Home and Housed: A Vision for Social Housing in New Zealand, at the Department of Building and Housing. David Vannier from the National Institutes of Health will research primary and secondary school science education practices and policy, at the Ministry of Education. Bruce Vaughn from the Congressional Research Service will research shared NZ-US interests in promoting stability in the South Pacific, at the Ministry of Defence and Victoria University of Wellington. Cornelia Weiss from the United States Air Force Reserves will research the impact of military justice, human rights and the rule of law on New Zealand Defence Force operations, at the New Zealand Defence Force.